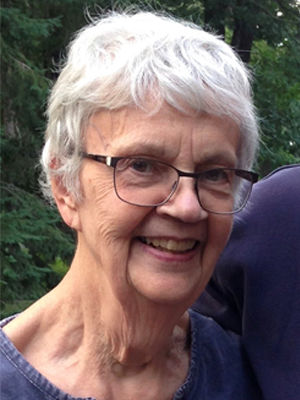 Jeanette Marshall, after a 7-year battle with Parkinson’s disease, passed away at her daughter’s home in Prior Lake, MN, holding her children’s hands, on January 30, 2019. She was 81 years old. God is a loving and forgiving God. A private family celebration of her life will be held. Chaplain Dea’dra Moore will preside. Jeanette was born March 1, 1937 to Nels U. and Edna Nelson in Kenmare, ND. She loved the life of a small town, enjoying Girls Scouts, band, church activities, and friends, all of which Jeanette included in her book, Happy Danes, written during her retirement. She earned her teaching degree from Minot State Teacher’s College, and later in life, earned 2 Master’s Degrees, one in Speech Pathology, the other in Learning Disabilities. Jeanette taught regular and special education, developing the Learning Disabilities program in Minot, ND. She was the L.D. Coordinator for Souris Valley Special Services, which serviced a third of North Dakota, for many years. While at Minot State, Jeanette met John, whom she married. They celebrated 60 years of marriage this past August. She loved and was proud of her children, Mike and Deb, and raised them with the belief that “Perfect was good”. Jeanette loved her travels; to Russia to adopt Deb’s daughter Emma, camping in the forests, hiking the mountains, standing in the sand by the oceans. But her greatest joy was sitting by a lake with a cup of coffee in her hand. Jeanette recently said, “I love that I had the opportunity to experience the awesomeness of God’s creations.” Her grandchildren brought life into her world. Their sense of humor brought Jeanette laughter that kept her young. So, miss her, but remember her in a happy way, through memories and laughter. Jeanette will be missed by her husband John Marshall; son, Michael (Debby) Marshall; daughter, Debra Marshall; grandchildren, Emma Marshall, Stephanie (Ryan) Krieger, Richard Marshall, Kyrsten (Craig) Fisher; great-grandchildren, Ava Winge, Caden, Lucas, Kate Krieger and other loving family members. She will also be missed by her bible study group, whom Jeanette cherished. There to meet Jeanette in heaven is her father, Nels U.: her mother, Edna: step mother Alice: sisters, Lorraine, Marion: step-sister, Carol; nephew, James and niece, Mary. Ballard-Sunder Funeral and Cremation proudly served and cared for the Marshall family. I was lucky enough to get to meet Jeanette on one of her adventures of a life time , in Russia picking up sweet Emma, I’ll never forget it . I’m sorry you are going thru this difficult time and I am praying for peace for you and family in the days ahead. Deb after John had it restored. Our thoughts & prayers to the family at this time of loss. I was blessed to be mentored in Minot by Jeannette in the field of Specific Learning Disabilities. What a fabulous teacher and friend. She continues to make my heart happy and grateful when I think of our many years working …and laughing…together❤️My heart goes out to John and the rest of her family. John, one of my very grateful thoughts are when I ride back to Minot from Fargo where Jeannette and I were dealing with medical issues, and you so lovingly invited me to ride home to Minot with the two of you. God’s angel that day. Thank you. And may He comfort you and yours during this difficult time. John, Myrna D. just told me about Jeannette, my heart goes out to all of you. A lovely, lovely person who made a difference. I have so many good memories of her but my favorite is when my daughter’s gerbils got out of the cage and I was terrified (wimpy me), she came over, caught them and back in the cage they went. Peace to all of you, her wisdom was an inspiration to all of us, peace my friend.